Daily Covet: Who knew lasers could be so pretty? 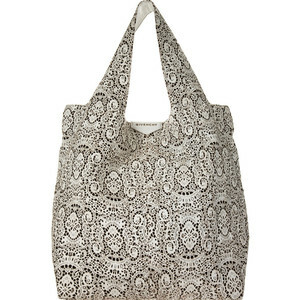 This gorgeous Givenchy laser-cut leather bag showed up in my daily Barney’s email this morning. I loved it immediately and had to post. It’s high fashion but slouchy, delicate but tough, old fashioned but current and it’s lovely enough to wear with a spring maxi dress but unstructured enough to wear with ripped up jean shorts and your favorite t-shirt. It’s a good thing it’s a timeless bag… because it’ll be a long time before I can convince my husband that I need it!